Harrop’s cartoon is the product of his cousin’s inspired suggestion that he fill a book with cartoons about the humorous accommodations made between couples who’ve lived together for decades. The book – “Living Together after Retirement: or, There’s a Spouse in the House” – reveals his personal knowledge of the subject. Harrop, who is 73, has lived with his partner, Annie, for more than 20 years. Kim, always enjoy your stories, find them to be very helpful, and this one is no exception. 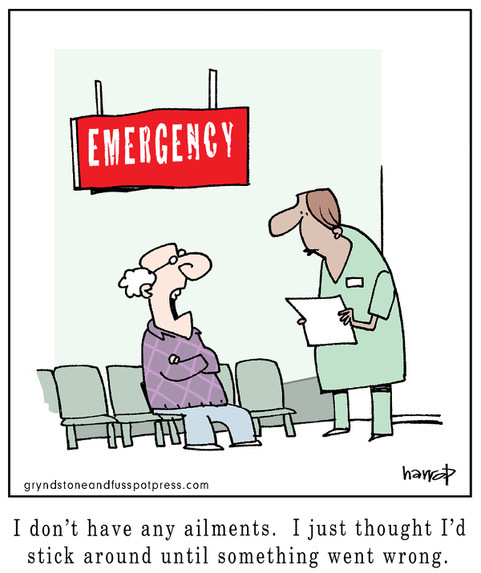 Mike – I took it from Harrop that the cartoon works for all old people, because of its message: you’re going to get SOMETHING but who knows what. However, your interpretation a la Canada certainly adds another layer to the humor! The one in four ratio after 75 was an eye opener. 1/5 was bad enough, but I will just keep walking and eating oatmeal and hope for the best. So good to read down to earth information. Thanks. Never thought I’d have so many doctors while I’m trying to stick around until I hit my 90’s. But I’m trying to stay positive about this! I am surrounded by folks within 10 years of my age (74). Ailments I have heard about in the last two weeks are, in no particular order: torn meniscus, bulging spinal discs, cardiomyopathy, torn ACL, arthritis of hip/knee/hands, atrial fibrillation, depression, diabetes, high blood pressure, sciatica, hearing loss, macular degeneration, broken hip/collarbone/elbow/rib, concussion, various cuts, abrasions and bruises from falls. Some folks live with the pain, others go through the Medicare process of step-by-step before the final test can be done to determine a symptom’s cause. I know one woman who refused a ride in an ambulance after taking a tumble on concrete steps that left her scalp bleeding. When the EMT’s told her the cost of ambulance ride, she insisted that her husband drive her to the hospital. Not that she couldn’t afford it, to her it was principle. I have been following all the popular health advice in a quest to make it to age 93: two pieces of dark chocolate every day, a glass of red wine every day (okay maybe two glasses), Tai Chi, olive oil, a handful of nuts, eight hours of sleep, no junk food, three meals a day, stay off ladders, and prayer. One more ailment: my tennis elbow that was caused by using manual hedge clippers. I am adding no yard work to my list for a healthy long life. That no yard work commitment is a very wise decision.